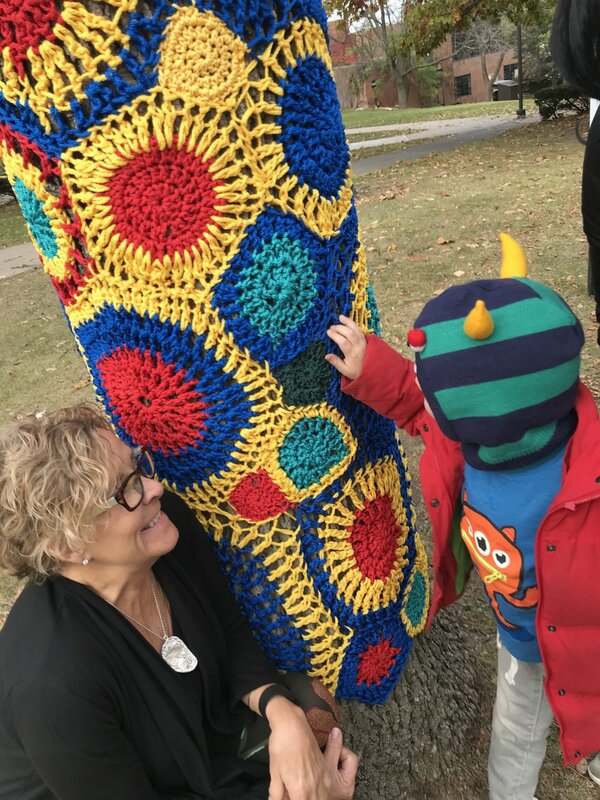 #YarnBombQC brought the sculptor Carol Hummel the the Quad Cities to work with our communities to create crocheted, site-specific, community-based public art on trees in three locations: Augustana College, the Figge Art Museum, and Longfellow Liberal Arts School. This project, like much of the art by Hummel, draws diverse sectors of communities together in a positive, celebratory way to help create major pieces of art for the people, by the people. Well over 100 community members participated by creating crocheted circles, which the artist and her assistants stitched together and installed on the trees. Participants included students from Augustana College, the Creative Arts Academy, Longfellow Liberal Arts, Western Illinois University, and St. Ambrose University, as well as community members ranging from age 8 to 80+. This project was organized by the Augustana Teaching Museum of Art, and is supported in part by an ArtWorks grant from the National Endowment for the Arts, as well as by the Augustana Art Department, Augustana College/Longfellow Liberal Arts School Partnership, Augustana Humanities Fund, Augustana Institute for Leadership and Service, the Creative Arts Academy of the Quad Cities, the Figge Art Museum, and Sunbelt Rentals. Our media sponsor is WVIK. To kick-off the project, Carol Hummel, and her assistant Molly Sedensky came to the Quad Cities. Hummel gave an artist talk that situated the project within her oeuvre, and Sedensky taught participants how to crochet. Packets of yarn and patterns for the project were then dispersed, for participants to work on at their own pace. With the project complete, we celebrated all the hard work of our volunteer crocheters, artist, and assistants. 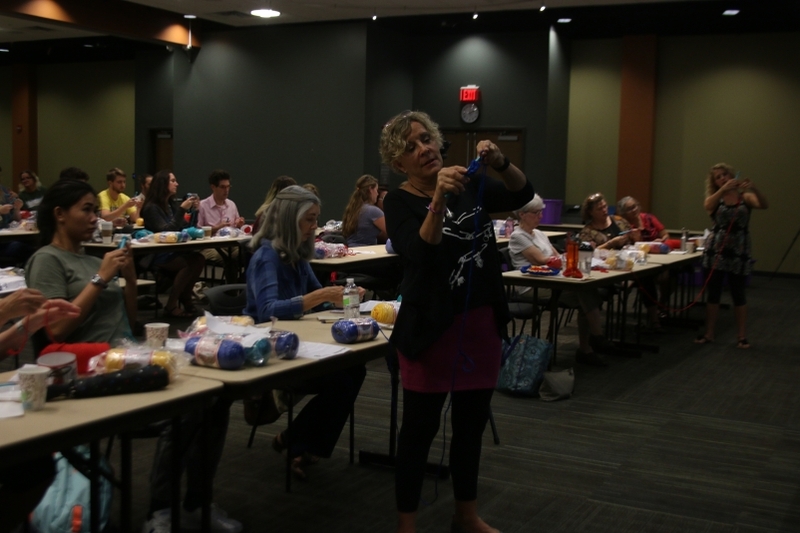 Between the workshops and the installation, we held a number of crochet-ins at various locations throughout the Quad Cities, so that participants could work together, socialize, and help each other along with their contributions of crocheted circles to the project. 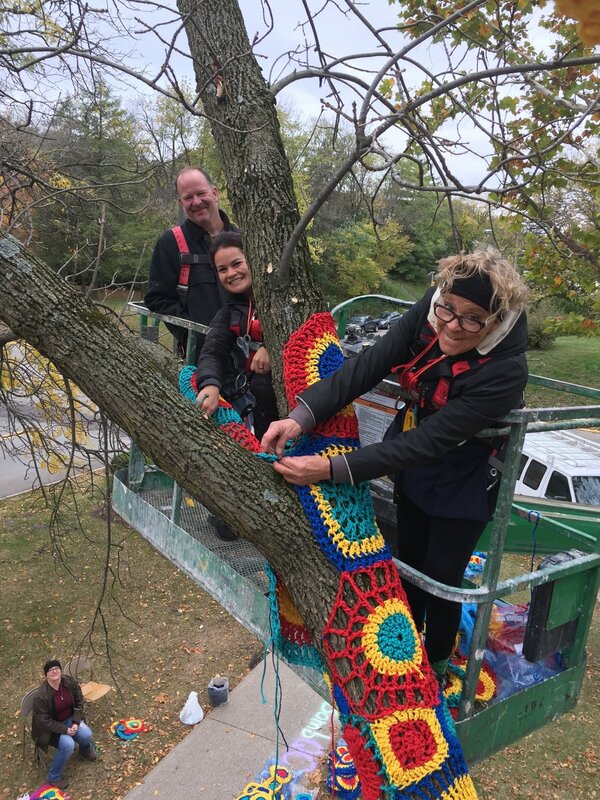 In late October, Carol Hummel returned to the Quad Cities with two assistants, Molly Sedensky and Julie Loxterman, to stitch the community members' circles together and cover 11 trees: one at Longfellow Elementary School, one at Augustana College, and 9 at the Figge Art Museum. At Augustana, they were assisted by two members of the College's facilities crew: Dave Apple and Brett Stabler. "Art museum director bringing soft fuzzy street art to Quad Cities"
"Augie organizes yarn bomb project"
"Augie infuses YarnBombQC community interest"
"Yarnbomb an explosion of color hits the Quad Cities"
"Artist and Yarnbomber at work in Quad Cities"
"Quad Cities responds to yarn bomb project in big way"
"Ohio artist brings yarn bomb movement to Augustana College"
"YarnBombQC warms hearts and trees"
"Community helps artist create YarnBombQC"
"The yarn bomb project is uniting the QC community"
"Community comes together for YarnBombQC"
"Students, faculty, and community come together for YarnBombQC"